The Tag Heuer Steve McQueen Edition Monaco Calibre 12 Automatic Chronograph Men’s Watch CAW2114.FC6177 is a classic symbol of masculinity and distinctive style; with the versatility to look great accompanying casual or formal wear. It is also far less clunky and heavy than other timepieces that feature a stainless steel bracelet. This luxury watch hearkens back to the first automatic chronograph (both timekeeping and stopwatch functionality) with the first square waterproof case, released in 1969 by TAG Heuer. That timepiece became instantly iconic, when Steve McQueen wore it in his 1970 film Le Mans. It remains a handsome timepiece, now updated with the latest high quality features and Swiss movement. By virtue of its square dial, the texture of its black alligator wristband, and the always elegant color duo of black with silver or white, this watch is eye catching, and definitely a fine piece for day or night wear. Its history also suggests masculine daring, along with innate confidence, but it is up to you to decide if this is simply a fine watch, or a potent symbol of manly qualities. What you can count on is the precision timekeeping, easy readability, and durability of the Monaco. Its luminous hands and index markers, contrasted with the black background of the dial, make this a watch easy to read in all lighting situations. This is also aided by the anti-reflective coating on the watch face. Sapphire crystal, known for its incredible resistance to scratches, protects both the dial and the open case back, which allows you to watch the Swiss made, calibre 12 movement in action. 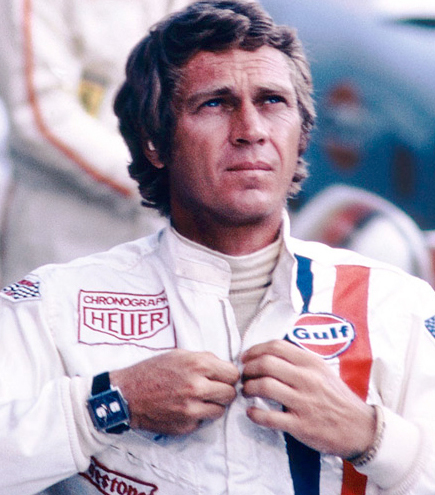 Steve McQueen wears a Monaco watch in his iconic 1970 film, Le Mans. Square black dial, 2 square white sub dials. Small date window at 6 o’clock position. Swiss made, automatic chronograph movement. Water resistant case, to 100 meters or 330 feet. Scratch resistant sapphire crystal on dial and case back. Skeleton case back reveals calibre 12 movement in action. White hour and minutes hands with red detail, red seconds hand. 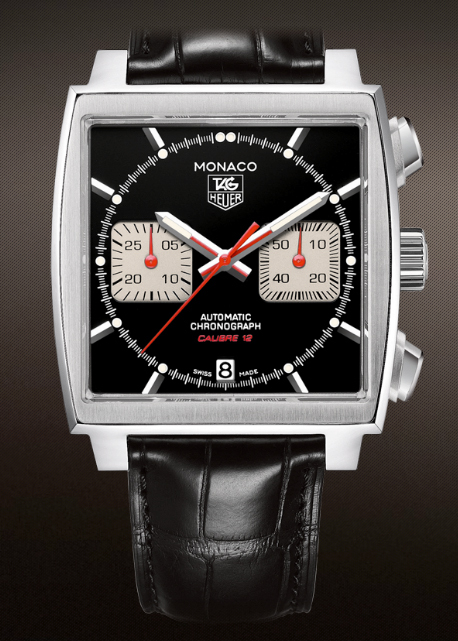 Alternate version of the Monaco CAW2114.FC6177 men's watch with all black dials. There is one variation on this particular model, which features an all-black dial, with white indexes and hands. While it is also striking in its bold style, I find it less legible at a glance than the version seen above, particularly with regard to the chronograph sub dials. If you might prefer a watch with the same Monaco calibre 12 features, but with a different strap or color, you should also check out the CAW2114.FT6021 model or the CAW2114.FC6183, which have a textured black rubber strap, and turquoise-blue dial with navy alligator strap, respectively. These can be viewed at TAGHeuer.com. Potential drawbacks for this watch are very few. While the case is water resistant to 100 meters, the wrist strap is alligator leather, and would certainly disintegrate if exposed to water often. If you prefer a timepiece that is completely submersible, you might be happier with one of Tag Heuer’s Aquaracer models, which were created with diving and water sports in mind. Additionally, the main dial of this watch is numberless, depending on index markers to indicate each hour, so if you prefer to see numerals, the Monaco collection is probably not your best choice. 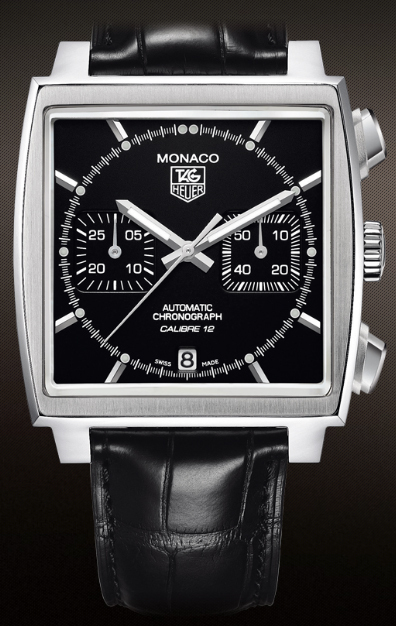 The retail price for this watch is $5,600, which places it at about the mid-range of all Tag Heuer timepieces. If this is too pricey for you, despite checking out some better online deals, you might want to consider this company’s less expensive collections, such as Formula 1, Aquaracer, Carrera, or Link.